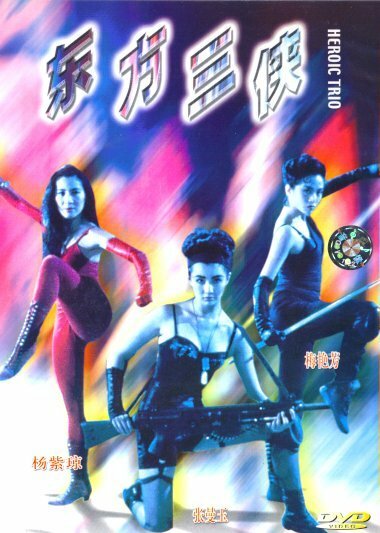 A Hong Kong combination of Batman and The Three Musketeers, The Heroic Trio is a winning mix of action, sci-fi, fantasy, and police caper starring three outstanding Hong Kong actresses. Former popular singer Anita Mui is Tung/Wonder Woman, a mysterious crime fighter who aids the police whenever needed. Michelle Yeoh is Ching/Invisible Woman, an unwilling disciple to an age-old Evil Master, and Maggie Cheung is Chat/Thief Catcher, a runaway enlisted by the Evil Master who is now a bounty hunter for hire. When baby boys are being stolen for a horrific plan, Tung assists in the investigation while Chat plans to make some bucks off of catching the culprit. The baby thief is none other than Ching, who is carrying out the kidnappings for the Evil Master with the aid of her lover's invention--an invisible robe. But the good in her wins out, and she joins forces with Tung and Chat. This is a superhero film, to be sure. Fantastic sets and impressive wire-strung fight choreography make The Heroic Trio extremely fun to watch. Wonder Woman enters the picture by running full-tilt atop power lines while Chat rides a motorcycle and wields a shotgun like the Terminator. The outlandish and complicated plot seems right at home here, heightened by the moody lighting and the combined screen presence of Mui, Yeoh, and Cheung. All three give fierce and touching performances in a hyperbolic and enjoyable film.